Sweet Pea by Kenneth Webb was the top lot. pass road in Skibbereen Sunday, June 2. He plans to hold another mainly furniture sale in Skibbereen in July. The top lot was Kenneth Webb’s Sweet Pea which made 5,750. Another work by Webb sold for 3,600. 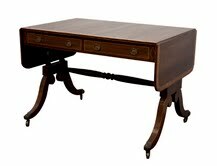 A Regency sofa table (pictured left) made 2,000. Other top antique furniture lots were a good Georgian chest of drawers which sold for 1.900, a William IV library table made 1,800, a 19th century crossbanded chest on chest made 1,600 and a Victorian walnut credenza sold for 1,400. There were 50 lots of silver and the top lot here was a Birmingham tea set which made 775. Chairs sold well too. A pair of William IV upholstered armchairs made 1,100 and a set of ten 19th century dining chairs made 1,200. Irish paintings fared badly at the Christie’s sale of 20th Century British and Irish art in London on May 27. 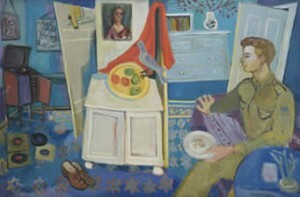 The auction house was hoping to achieve a price of over a million pounds for a 1949 Yeats entitled Until we meet again. The painting, which was probably over estimated, failed to sell. In fact only three of the 13 Irish lots found buyers in a sale which was largely unpromoted in Ireland. The view in this country is that the new policy at Christie’s of mixing Irish with British 20th century art in the same auction does not work. One of the four works by Paul Henry, his only known still life, entitled Chrysanthemums, sold. It made 51,600. The Music has come by Yeats made 55,000. 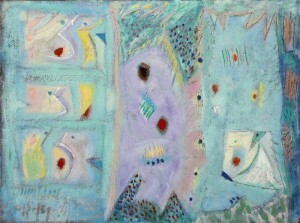 A William Scott, entitled Together, made 22,500 and another Scott failed to sell. Christies failed to sell works by Louis le Brocquy, Sir John Lavery, Colin Middleton, Sir William Orpen and William Conor. 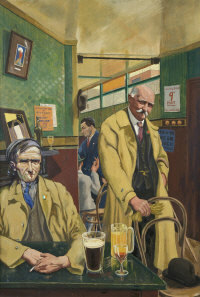 A total of 390 lots of important Irish Art comes under the hammer at two sales in Dublin this week. The Adams Bonhams sale of Important Irish Art in Dublin on Wednesday June 2 at 6 p.m. will feature 168 lots. There are three large works by Tony O’Malley from the McClelland Collection, recently on loan to the Irish Museum of Modern Art. Various Events 1979 is estimated at 40,000-60,000, Irish Inscape with Skull, Callan 1981 is estimated at 20,000-30,000 and Two Winter Drawings with Panels 1981 is estimated at 10,000-15,000. Harry Kernoff’s In Davy’s Back Snug (1936) is estimated at 50,000-70,000 and Gerard Dillon’s In the London Flat has an estimate of 60,000-80,000. There are four works by Colin Middleton in the sale, the top two estimated at 40,000-60,000, another with an estimate of 30,000-50,000 and one at 20,000-30,000. Also featured are two tapestries by Louis le Brocquy estimated at 25,000-35,000 each and a watercolour from his Procession Series. Sir John Lavery’s Portrait of Mrs. Arthur Franklin is estimated at 40,000-60,000, Edward McGuire’s Owl with Oak Leaves has an estimate of 15,000-20,000 and George Collie’s monumental depiction of the fruit and vegetable market at Smithfield in 1927 is estimated at 30,000-50,000. 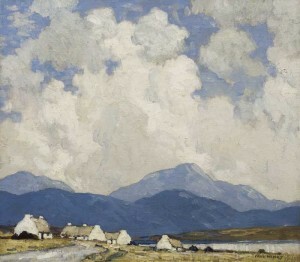 Other artists featured include Daniel O’Neill, George Campbell, Jerome Connor, William Conor, James Humbert Craig, Lilian Davidson, Charles Lamb, Markey Robinson, Patrick Collins, Evie Hone, Letitia Marion Hamilton, Patrick Hennessy, Paul Henry, George Russell Æ, Mary Swanzy, J.B. Vallely and Jack B. Yeats. Viewing at St. Stephen’s Green is from 2 p.m. to 5 p.m. on Sunday, May 30, from 9.30 a.m. to 5 p.m. on Monday and Tuesday, May 31 and June 1 and from 9.30 a.m. to 4 p.m. on Wednesday June 2. The Turn of the Road, a classical Connemara landscape by Paul Henry, features in the Whyte’s sale of Important Irish Art on Monday May 31 at 6 p.m. Discovered during Whyte’s valuation day in Belfast in January it is estimated at 60,000-80,000. In Henry’s oeuvre this painting was previously untraced or unidentified by Henry expert Dr. S.B. Kennedy. There is particular Cork interest in this 222 lot sale as it includes 81 works from the collection of the late senior counsel Jim O’Driscoll, a former director of the Fenton Gallery in Cork and a supporter of local and national artists. Some of these are relatively new to the auction market, as their work is more likely to be found in contemporary galleries. Cork artists featured include Diarmuid O Ceallachain, Bridget Flannery, Maurice Desmond, Jill Dennis, Michael Mulcahy, William Harrington with sculptural works by Eilis O’Connell and John Burke. Of the contemporary artists championed by Jim O’Driscoll, Tony O’Malley, John Shinnors, Charles Tyrrell and William Crozier dominate in this sale. His collection also features works by Gerard Dillon, Nano Reid, Brian Bourke, Patrick Scott and Louis le Brocquy. A le Brocquy watercolour from 1946 entitled Tinker Children at a Fair is estimated at 30,000-40,000 and there are works by Daniel O’Neill, Jack Yeats, Paddy Graham, Francis Bacon, George Campbell, Hughie O’Donoghue, Ciaran Lennon, Cecil King, Mainie Jellett and Basl Ivan Rakoczi. Viewing and the sale will take place at the Clyde Rooms in the RDS from 6 p.m. to 8 p.m. on Friday, May 28 and from 10 a.m. to 6 p.m. on Saturday, Sunday and Monday, May 29, 30 and 31. Sotheby’s will stage a single-owner sale of superb 17th- and 18th-century antique Venetian paintings and furniture in London on July 6. Each of the 64 lots in the sale was chosen with care and a keen eye for quality by a private European family, who acquired the pieces over a period of some 30 years in order to adorn their palazzo in the Veneto region of Italy. Taken as a whole, the collection evokes the dazzlingly beautiful world that existed inside some of Venice’s most splendid palazzi during some of the most prosperous and charmed years of the Venetian Republic. Chosen for their quality and enduring beauty, the pieces in the sale summarise the qualities that characterise “Venetian style”. Just as its painters drew heavily on the lapis lazuli and exotic pigments made available to them by their city’s tradings with the East, so too Venetian craftsmen and furniture makers drew on the materials and techniques they encountered thanks to their contact with the East. Though many of their names are unrecorded, Venetian craftsmen of the 17th and 18th centuries were nonetheless masters of their art – be it in the production of furniture, glass, velvets and silks, lacquered goods inlaid with mother of pearl and pietre dure, or maiolica inspired by Turkish wares and porcelain. Much of the furniture in the sale reflects the diversity of media which characterises Venetian craftsmanship. At the same time, the majority of the pieces in the collection date from the Rococo period, the style of which, with its lightness, airiness and sinuosity, is in many ways perfectly matched to place from which the pieces emanate. 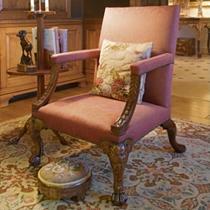 This mid 18th century Irish parcel gilt library armchair estimated at 25,000-35,000 dollars failed to sell. 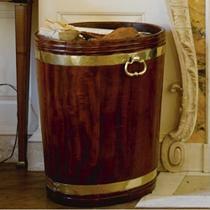 THIS Irish brass banded mahogany peat bucket made 25,000 at Sotheby’s two-day auction of The Collection of Patricia Kluge at Albemarle House, Charlottesville, Virginia on Tuesday June 8. It had been estimated at 10,000-15,000 US dollars. An Irish parcel gilt library armchair failed to sell, an Irish mahogany billiard table which had been estimated at 15,000-20,000 made 27,500 dollars and an 18th century inlaid oak octagonal centre table catalogued as possibly Irish made 17,500. The first on-site house sale conducted by Sotheby’s in North America in over 20 years drew collectors, interior designers, and dealers from all over the globe. It brought in $15,158,227, exceeding pre-sale expectations of $9/14 million. The top selling lot was this Imperial Chinese table clock, Guangzhou Workshops, Qing Dynasty, Qianlong Period, which made $3,778,500, more than three times the high estimate of $1 million and the third highest price achieved for a clock of its type . A set of four Irish glass table display centrepieces commissioned by the Fifth Earl Spencer when he was Viceroy of Ireland are destined to help pay for the current re-roofing and renovation project at Althorp Estate in Northamptonshire, England. The attics, basements and stables of Althorp, ancestral home of the late Princess Diana, are currently being catalogued for three sales of art and antiques this summer. The proceeds will pay for the current re-roofing and renovation project at Althorp Estate. The antique Irish glass pieces, which are among a number of Irish lots to have emerged due to the family’s long association with this country, are estimated at 15,000-25,000 pounds sterling. The sales are expected to make £20 million, of which half will come from the sale of two old masters, a Rubens and a Guernico. The Althorp attic sale will take place at Christie’s South Kensington on July 7-8 and is on show from July 3-7. The Spencer House sale will take place at Christie’s King Street on July 8. There will be a public exhibition from July 2-8. 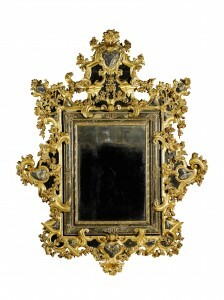 The old masters and 19th century art evening sale will take place on July 6. THERE is no open market for the art works by Picasso, Matisse, Braque, Modigliani and Leger stolen in Paris. Valued at 100 million euro they are all very well known. They may be ransomed or traded by organised criminals for prices far lower than their market value. The paintings were reported missing on May 20 after workers noticed a smashed window as they were opening up the Musee d’Art Moderne located at 11 Avenue du President Wilson in the 16th district. A single masked intruder was caught on a video surveillance camera entering the museum by a window. The missing works are Pablo Picasso’s Dove with Green Peas , Henri Matisse’s Pastorale, Georges Braque’s Olive tree near l’Estaque , Amedeo Modigliani’s Woman on the range and Fernand Leger’s Still life with candlesticks. In New York Sotheby’s evening sale of contemporary art on Wednesday May 12 brought in a total of $189,969,000, well over the pre-sale estimate of $114/162 million. Five new artist records were set and the sale was 94.3% sold by lot. Highlights of the evening were Andy Warhol’s Self Portrait from 1986, which more than doubled the high estimate to sell for $32,562,500 and an Untitled Mark Rothko painting from 1961 which made $31,442,500. Jackson Pollock’s Number 12A, 1948: Yellow, Gray, Black, made $8,762,500. At Christie’s in New York on Tuesday evening the collection of late author Michael Crichton realized $93,323,500 (£63,459,980/€ 73,725,565) and sold 100% by lot and by value. Jasper Johns’ Flag, 1960-1966 made $28,642,500 million (£19,476,900/€ 22,627,575) (estimate: $10 million-$15 million), the highest price ever achieved for a work by Johns at auction. The revival in the contemporary art market is demonstrated by the fact that the series of May auctions in New York brought in $592 million, more than 175 per cent higher than the $213 million achieved in May 2009. 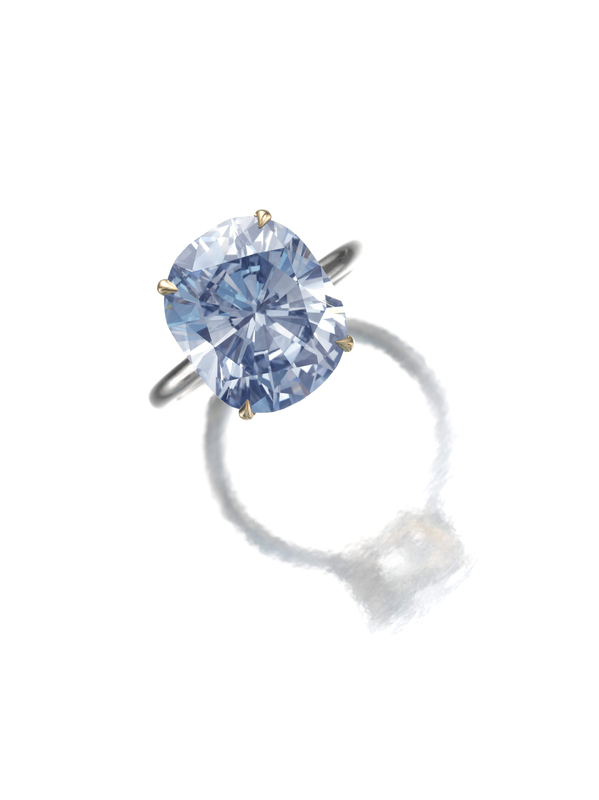 A cushion-shaped fancy intense blue diamond ring weighing 7.64-carats established a new world auction record price per carat for a fancy intense blue diamond at Sotheby’s in Geneva on May 11. It made $8 million (6.31 million euro) in a series of three May sales in Geneva which brought in a total of over 42 million euro. The total of Sotheby’s worldwide sales of jewels this Spring amounted to $147.7 million or 116.5 million euro. Sotheby’s said there was lively and competitive bidding across the board for top-quality jewels at all price levels – coloured stones, white diamonds, glamorous signed pieces or jewels with historic and noble provenance. Collectors and jewellery lovers from all corners of the world were out in force, bringing overall sell through rates of 88% by lot and 97% by value. In addition more than 74% of the lots sold, achieved prices in excess of their high estimate. THE feature lot, an Irish mahogany side table, in the manner of Williams and Gibton of Dublin, failed to sell at the Lynes and Lynes sale on May 22. The top lot was a three piece French giltwood suite which made 2,500. A pair of Edwardian drawingroom cabinets in mahogany and satinwood, probably made in Dublin, sold for 2,200. A Georgian chest of drawers made 700, A butlers tray and base made 340, a cast iron and timber garden seat sold for 260, a two door Georgian wardrobe made 900 and a distinctive set of six Georgian chairs sold for 680. The sale of 125 lots was around 65 per cent sold. 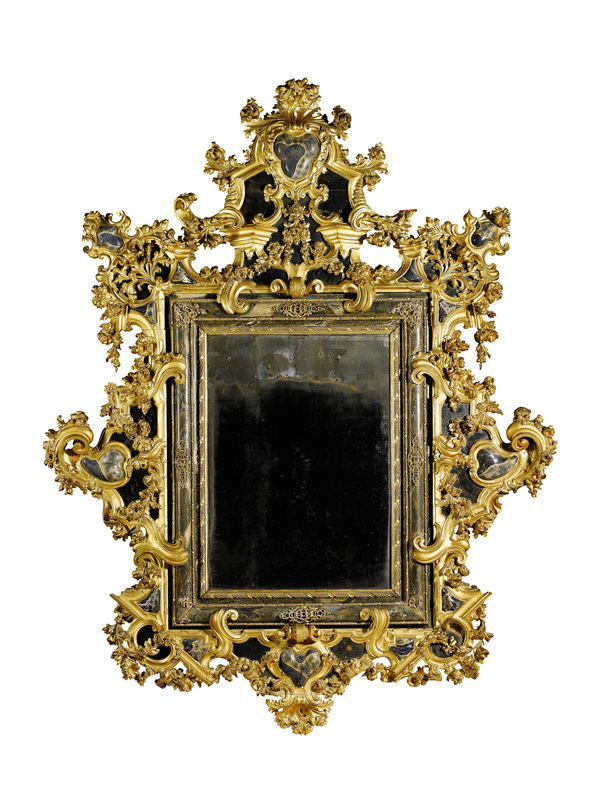 Several of the more expensively estimated lots, like a pair of antique giltwood mirrors, failed to find buyers in a market which proved to be tough. 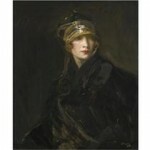 The Gold Turban, Sir John Lavery’s portrait of his wife Hazel sold for 481,250 pounds sterling or just over 566,000 euro at the annual Sotheby’s Irish Sale in London on May 6. It was a mixed day for Sotheby’s as just 44 of the 108 lots on offer found buyers. The highest grossing sale of Irish art so far this year brought in 1.826 million sterling (2,150,950 euros). The sale was 59.3 per cent sold by value. The most expensively estimated pieces sold better than paintings of lower value. The biggest problem currently besetting the Irish art market is the difficulty in finding top quality works to sell. Potential sellers are still holding off. There is little problem in finding buyers for museum quality works. There was some surprise that a large abstract by Sean Scully, Eriskay, failed to sell but Sotheby’s are confident that they will get this one away very soon. It was estimated at 200,000-300,000. The real problem is at the middle of the market. Sotheby’s had too many mid market pictures on offer this year. Louis le Brocquy’s Spanish Shawl, a study in white made 361,250, James Christopher Timbrell’s Carolan, the Irish Bard, exhibited at the Royal Academy in 1844, made 39,000, Roderic O’Conor’s Paysage Ensoleillé made 181,250, A garden in a city at night by Jack B. Yeats made 121,250, The Morning Exercise by Basil Blackshaw made 103,250, White House at the Last Stop by John Shinnors made 37,250 and a watercolour by Harry Kernoff, At the Railway Station, made 54,050. A number of other lots by Kernoff failed to find buyers. A view of part of Dublin Bay by Richard Brydges Beechey (1810-1895), exhibited at the Royal Hibernian Academy in 1869, made 43,250 and a pencil drawing of a young girl by Frederic William Burton (1816-1900) made 17,500. Two works by Aloysius O’Kelly made 15,000 and 12,500 respectively but a number of others by the same artist failed to find buyers. Sotheby’s reckoned that they would have readily sold two or three years ago. UPDATE: SEAN SCULLY’S WORK ERISKAY SOLD FOR £193,250 AT SOTHEBY’S CONTEMPORARY ART DAY AUCTION ON JUNE 30, 2011. FOR THIS SALE IT WAS ESTIMATED AT £150,000-£200,000.